Demand for an education from the University of California, Merced, remains high, with 22,632 applicants competing for admission for 2,100 undergraduate seats in Fall 2016, an increase of 13.5 percent over last year’s total. The rate of growth is the highest among all campuses in the University of California system for the second consecutive year and more than double the systemwide growth rate of 6.4 percent. In November, the UC Board of Regents approved the essential provisions of the 2020 Project, which will double the physical capacity of campus by 2020 and allow the campus to expand enrollment to 10,000 students within five to seven years. Data released today (Jan. 11) by the UC Office of the President, shows that UC Merced received 19,683 applications from prospective first-year students, a 12 percent increase from last year and a nearly 30 percent increase from 2014. UC Merced also received 2,949 transfer student applications for Fall 2016, an increase of 27 percent compared with Fall 2015. According to Associate Vice Chancellor for Enrollment Management Jill Orcutt, the campus’s enrollment target for the Fall 2016 undergraduate class is approximately 2,000. Total campus enrollment is currently about 6,700 students. The Classroom and Office Building 2, scheduled to open this April, will add more than 77,000 square feet of space, including classrooms and research labs to support the campus’s projected growth needs. Again this year, UC Merced leads the system in the percentage of applicants who come from low-income households (60 percent), and whose parents didn’t receive a four-year degree (66 percent). 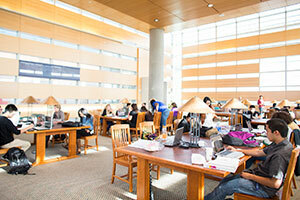 The deadline to apply to UC Merced’s graduate programs is Jan. 15.